Women farmers in the district shine a beacon for empowerment by growing and selling rice saplings. Sumitra Devi and Manju Devi are women farmers with a difference. They are raising rice nurseries that are part of a paddy sapling bank, locally known as the Dhan Bichra Bank. It is an innovative initiative by women farmers that has become a source of their livelihood and brought a change to their lives. Sumitra and Manju were ordinary housewives till three years ago. They used to work in the fields occasionally without any recognition, but now are running and managing the paddy sapling bank. They are selling rice saplings from their nurseries to small and marginal farmers, and earning a decent livelihood. They are not alone. 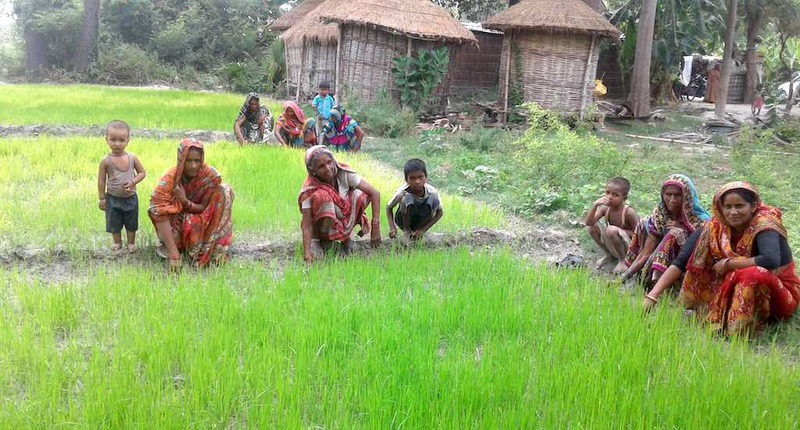 There are hundreds of such women farmers who are engaged in raising paddy nurseries and selling saplings in dozen of villages in the Muzaffarpur district. These women use a system of root intensification, popularly known as the SRI method, a scientific technique to cultivate paddy saplings on time, to sell for transplantation that helps farmers, who get readymade paddy saplings without any risk. This initiative shows Muzaffarpur in a different light at a time when reports of sexual abuse of women at a shelter for the homeless in the district town has shaken the country’s conscience. The tale of empowerment is a counterpoint to the shameless exploitation of homeless women in different parts of the country. Unlike Manju, Rekha Devi of Amaitha village and Meneka Devi of Biseshar Patti village in Sarayia block have been raising paddy nurseries for selling only. “This time I have raised a paddy nursery in four katha of land and sold saplings of nearly three katha,” Manju said. Similarly, Meneka, who raised a nursery in three katha of land, sold saplings of over two katha. “I will earn more than expected because demand of paddy saplings for transplantation is high,” she said. These women farmers’ exposure to outside of the four walls of their homes has improved their status at the community level. They have increased self-confidence by being recognised as a contributing farmer. “At last, our contribution to agriculture is accepted and recognised, thanks to paddy sapling nurseries,” Rekha said. Ramesh Mahto, a marginal farmer of Arar Lakhmipur village, admitted that paddy nurseries are not in good shape for want of water. Due to scanty rainfall, the land is dry, there is no facility of irrigation and the underground water table has depleted. “Only those farmers who have managed diesel pumps or other means of access to water sources are able to maintain the nurseries,” Mahto said. He said these women farmers belonging to self-help groups (SHGs) are associated with village level organisations were trained by experts to provide them latest know-how to raise paddy saplings. The women farmers are using local varieties as well as hybrid varieties of seeds to raise the raising nurseries. They go for seed treatment for local variety of seeds. “Their paddy nurseries are organic and they hardly use chemical fertilisers,” he said. Sanjay said a paddy nursery in one katha land sold for Rs 2,000 and a women farmer could earn a profit of Rs 700 to Rs 800. “First we prepare bed for nursery by deep ploughing, followed by levelling. After that we put seeds treated with organic method and wet with water. Initially, for two to three days, the bed is covered by hay and after the paddy germinates, we remove it and seedlings take a few days to grow,” Gita said. Kaushalender Kumar, agriculture manager of Jeevika, the state government’s rural livelihoods programme, said the paddy sapling bank by women’s group is a hit in several villages in flood-prone Muzaffarpur. In last three years, a large number of women have joined the paddy sapling bank to earn a livelihood. This has empowered them in Saraiya, Kurhani, Sahebganj, and Bandra administrative blocks in the district. Kumar, who work in close association with women farmers, said they have adopted Srividhi, as this programme is called, because it requires less water and gives two to three times the yield compared with traditional cultivation methods. Srividhi aims to stimulate the root system of plants rather than trying to increase yields in the conventional way by using improved seeds and synthetic fertilisers. According to the SRI International Network and Resources Centre at Cornell University, an estimated ten million rice farmers in 60 countries have adopted SRI. In impoverished Bihar, more than 335,000 hectares of rice are grown using SRI methods. This article originally appeared on VillageSquare.in. You can read the original article here.